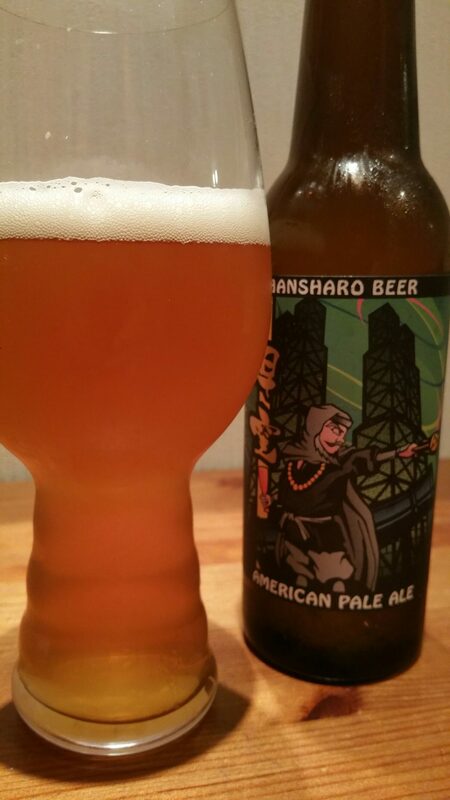 Hansharo Soun APA, also known as Hansharo American Pale Ale, is a 5% American Pale ale from Hansharo Beer, based in Shizuoka Japan. It’s part of their all-year round up and can be found in both bottles and cans. There may be some bottles of Hansharo Soun APA with the “old” design on them, a simple logo of Hansharo Beer, though in 2016, the bottles were redesigned with characters symbolising the meaning behind the kanji. Soun, which can also be read as hayagumo, means “early clouds” in English – perhaps an impending storm or the first beer of the night? Hansharo Soun APA is brewed with Simcoe, Citra, Polaris, and Hallertau Blanc hops. Loving the new designs from Hansharo Beer. Hansharo Soun APA poured out a light, hazy copper colour with a smidgen of clear white head on top – even in the IPA glass, not much developed besides what’s in the picture. It had a pungent citrus and peachy aroma that was balanced very nicely with hints of a slight caramel aroma from the malts in the background. The body was as crisp as the aroma, with the flavours well balanced. Hansharo Soun APA had an initial bitterness to it that was smooth and didn’t outstay its welcome. There was a grapefruit citrus flavour that lasted throughout drinking, and was paired well with the subtle caramel influence from the malts. The flavours were crisp when the beer was chilled, but remained crisp throughout drinking, even when Hansharo Soun APA had warmed up to warm temperature. The only problem with Hansharo Soun APA would be the carbonation as it felt a tad flatter than I would have liked from an American pale ale. Hansharo Soun APA is a decent American pale ale that is very drinkable and recommended.